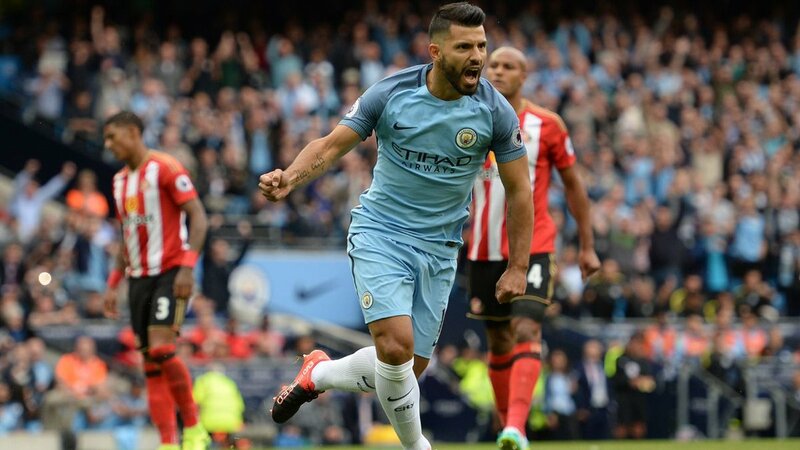 Title favourites Manchester City started their campaign with a slender victory over Sunderland, thanks to Paddy McNair's late own goal at the Etihad Stadium. 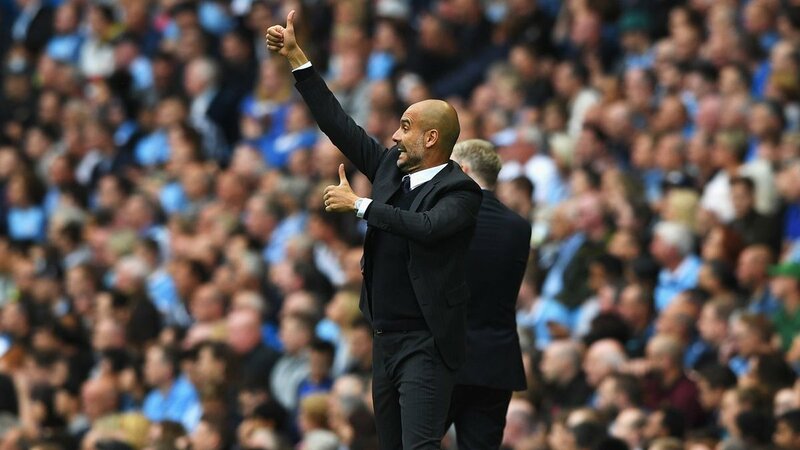 It marked a victory for Pep Guardiola in his first Premier League game in charge, with Sergio Ageüro's first-half penalty being cancelled out by a poaching effort by Jermain Defoe in the final quarter of the game. Paddy McNair turned Navas' cross into his own net to ultimately separate the sides on the opening day of the Premier League season. Ahead of Pep Guardiola's first Premier League game, the goalkeeping situation was plastered over the headlines as the new manager opted to play Willy Caballero in between the sticks, as oppose to number one Joe Hart. The Argentine was thrown into action in the early minutes, stopping an early free-kick driven towards him by Patrick van Aanholt. It was the Sunderland full-back, though, who would give the hosts a surefire chance just moments later on the opposite attack. A ball headed on down the right wing was chased on by Raheem Sterling, striding into the box where a sweeping challenge took him out and awarded a clear penalty. 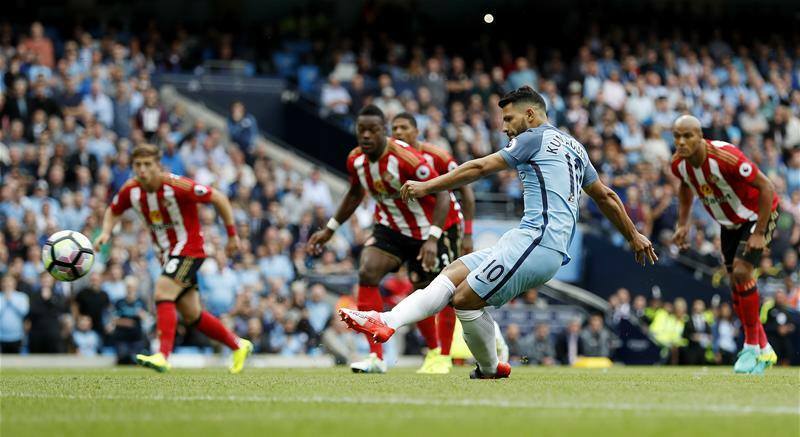 Sergio Agüero did not need a second invitation, smashing it to the left to score the first Premier League goal of the Guardiola era. From that point, the game was City's for the taking. They controlled possession, elegantly moving the ball around with their opponents frozen at times due to lack of ideas. Kevin De Bruyne and David Silva patrolled in an attempt to create a second goal, while new signing Nolito cut on to his right to send a shot fizzing past the woodwork. However, after a first half of complete control, the Citizens would go into the break breathing a sigh of relief. Lamine Koné's ball found Jermain Defoe in point blank range after slipping a gap in the area, where the Englishman prodded it straight at the keeper - meaning after 45 minutes, the sky blue contingent went in with a lead, but were waiting to really burst into life. Sergio Agüero was inches away from adding to his tally in the early goings of the second half as his low effort on the bounce was dragged wide to culminate another solid period of play, and Jesus Navas' inclusion would only liven up their options going forward. However, in the blink of an eye on the 71st minute, the Black Cats got themselves back into the contest thanks to their hitman Jermain Defoe. Jack Rodwell found a gap to slip through the defence, where the Englishman was waiting to turn and slot it past the keeper. Pep Guardiola's face was one plastered with frustration and shock. His players seemed pretty startled too, with a very drab immediate response. With a draw in sight, Sunderland began to get the numbers behind the ball, while Manchester City had to dig deep and find something to start their season off with a win. At the source of it was the substitute who changed the game, Jesus Navas, who zipped a cross past the face of goal and bouncing on towards Paddy McNair who headed it into his own net. It could have all been secured when Iheanacho's shot was deflected over the bar, but the failure to take the opportunity left Sunderland with some hope to cling on to. Some late corners were headed away, and that was it - Guardiola took 3 points on his first Premier League game, but it wasn't without difficulty.